TORONTO — Canada’s minister of economic development said he is “cautiously optimistic” about progress being made on automotive rules of origin during North American Free Trade Agreement renegotiations. Navdeep Bains, the minister of innovation, science and economic development, told Automotive News Canada that it appears NAFTA talks are “headed in the right direction” as the United States softens its demands on autos, one of the biggest sticking points in NAFTA talks. The Trump administration has reportedly backed off its original demand that 85 per cent of a vehicle’s content be produced in one of the NAFTA nations to be exempt from tariffs, up from the current 62.5 per cent requirement. According to the Canadian Press, the U.S. is now pushing for a 75 per cent requirement. The U.S. also recently dropped its proposal that 50 per cent of a vehicle’s content must be made in the United States to be traded tariff-free. How a potentially renegotiated NAFTA handles automotive rules of origin will be key for the North American auto industry, which has grown to rely on a heavily integrated supply chain between Canada, the United States and Mexico. Auto components are frequently shipped across the border numerous times before a vehicle is shipped to a dealership for purchase. Bains spoke following a roundtable discussion he hosted in downtown Toronto with several top Canadian auto executives. 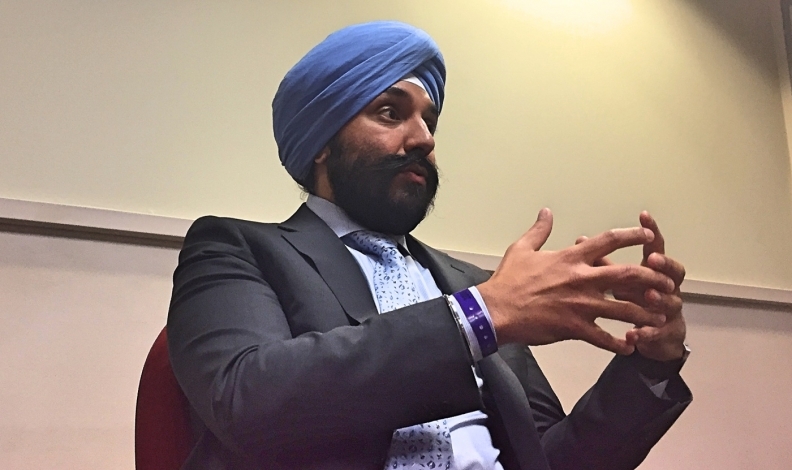 According to a spokesman, Bains spoke in person or over the phone with representatives from each of the five Canadian auto assemblers — the Detroit Three, Toyota and Honda — and the CEOs of Canada’s largest parts suppliers, Magna International Inc. and Linamar Corp.
Bains said the panel broadly focused on two topics: Trade and the future of the auto industry. He said a “major takeaway” was that there is broad agreement that Canada should leverage research into artificial intelligence and other emerging technologies to attract investment. “There was a clear understanding we need to be flexible, we need to work together, we need to better align ourselves with our provincial and municipal governments to really leverage some of the progress being made on artificial intelligence,” Bains said. He said the executives frequently brought up the need for Canada to be able to train more workers and attract more international talent in those areas. He pointed to the federal government’s Global Skills Strategy program, which allows some highly skilled immigrants to enter the country in as little as two weeks, as an example of the government addressing those concerns. Bains said the group did not “extensively” discuss zero-emissions vehicles or federal plans to boost ZEV sales, though he said the government is in an ongoing discussion with the industry about how to make electric vehicles more attractive to consumers. “We need to make sure these vehicles that are produced are purchased, and we want to make sure we do a better job of working with industry to explain the benefits in terms of not only technology but the environmental benefits and that we’re presenting the solution at an ideal price point,” he said. The federal government is expected to unveil a national strategy to boost ZEV sales later this year. Bains told Automotive News Canada in January he was personally opposed to making ZEV sales quotas, such as those in Quebec and California, part of that strategy, though he stopped short of saying they would not end up in the government’s final plan.